DFP Seni Fest 2014 Returns At Dewan Filharmonik PETRONAS!!! 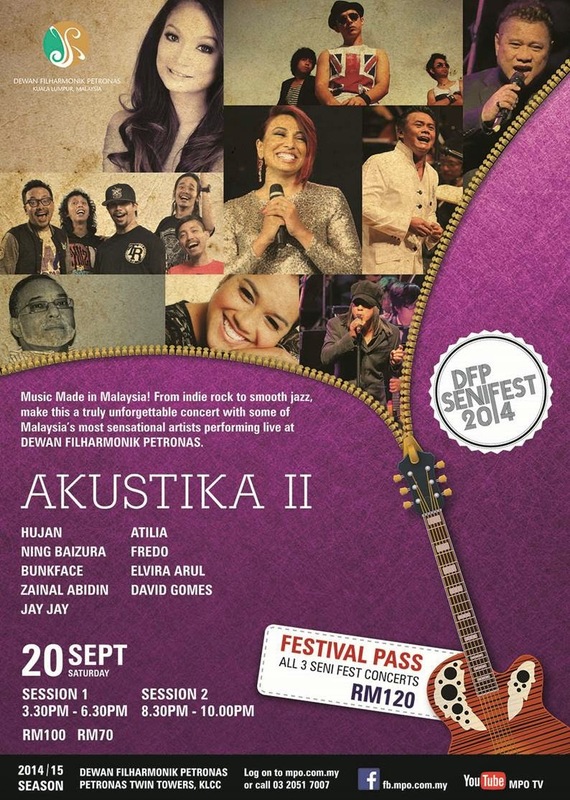 Kuala Lumpur, September 2014 – Dewan Filharmonik PETRONAS (DFP) is proud to present the DFP Seni Fest 2014 in September. This is the fifth year for DFP Seni Fest to be held and it is offering more & more exciting showcases that feature some of our country’s prominent artistic talents! A few days ago, our team from wljack.com & loong-updates.blogspot.com were given a chance to take part in a press conference of Akustika I of DFP Seni Fest 2014! In the previous festivals, DFP and the Malaysian Philharmonic Orchestra (MPO) have presented a variety of music genres and collaborated with renowned artists, painters, ensembles and traditional art groups. 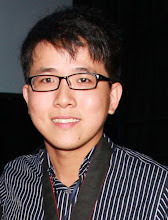 The festival stays true to its objective this year in promoting and nurturing local talents and music whilst adopting s slightly different approach to make it a unique and special happening. Festival Commencing This September! Promising Lineups Of Events! The festival will be starting on 16th September 2014 and will end on 21 September 2014. During this period, there will be events happening that include two unplugged concerts, one MPO concert and an exhibition throughout the week. Akustika! Unplugged Concert Featuring Newbie as well as Prestigious Artistes! The unplugged concerts are themed Akustika and will be featuring a great range of local artistes, from the “newbie” ones to the established ones. This wide range of artistes is surely able to catch the attention of the audiences from different categories of age group. In this concert, the performers will be displaying their brilliant musicianship which consists of a variety of music genres; ranging from ‘indie’ music, rock, pop and R&B to jazz. Press Conference of Akustika I! Last Thursday, we media members have had a press conference session with Mr Carl Selvarajah (Director, Dewan Filharmonik Petronas), Andy Flop Poppy, Diandra, Man Kidal and Alex Subryn. We get to know more regarding of what to expect from the concert of Akustika I.
Mr Carl mentioned, “I think the most important is, the local artistes having that platform, to stand on DFP stage, the superior acoustic stage of the hall, to display their showmanship and their blend of music.” He hopes that the fans can come and support their favourite artistes in a different atmosphere in DFP. On the other hand, all of the artistes present at the press conference were happy that they were being selected as the performers for the concert. This is the first time for most of them to perform in DFP and they are looking forward to create some magical moments on that prestigious stage! The festival allows the cross genre music to stand on the same stage. It is a definitely a move-out-of-the-box move by DFP. It is also a great opportunity for the local artistes to stand on top stage. Another good news about the DFP Seni Fest is, there will be a Festival Pass priced at RM 120 for all three concerts. 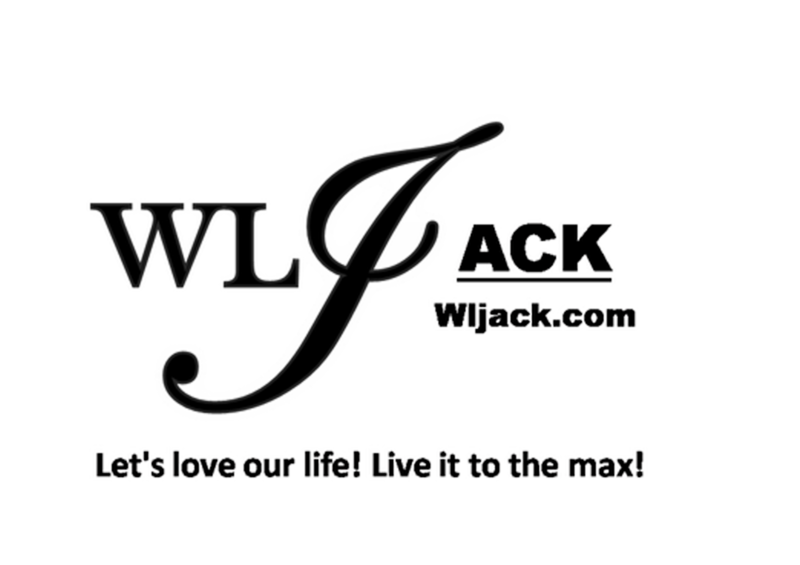 So, all the music lovers should check out the festival! The festival will culminate with a concert by the MPO themed Malaysia Tanah Airku on Sunday, 21st September 2014 at 8.30pm. This concert will be presenting patriotic and folk songs which were specially-arranged. Each song will be having its own story that could reflect our rich musical heritage and encompass the unifying theme of love, sacrifice and hope. It will be a trip down the memory lane as songs such as Seri Mersing, Tanah Pusaka, Cindai, Jauh Jauh, Jeritan Batin and Puteri Santubong will be played. The MPO will be conducted by Jason Lim and will collaborate with popular singer Dato’ M Nasir who will sing Bonda, Dato’ Yusni Hamid (Tinggallah Mustika Hati), Nassier Wahab (Wahab) dan Datin Alyah (Joget Kenangan Manis), making an unforgettable concert that should not be missed! 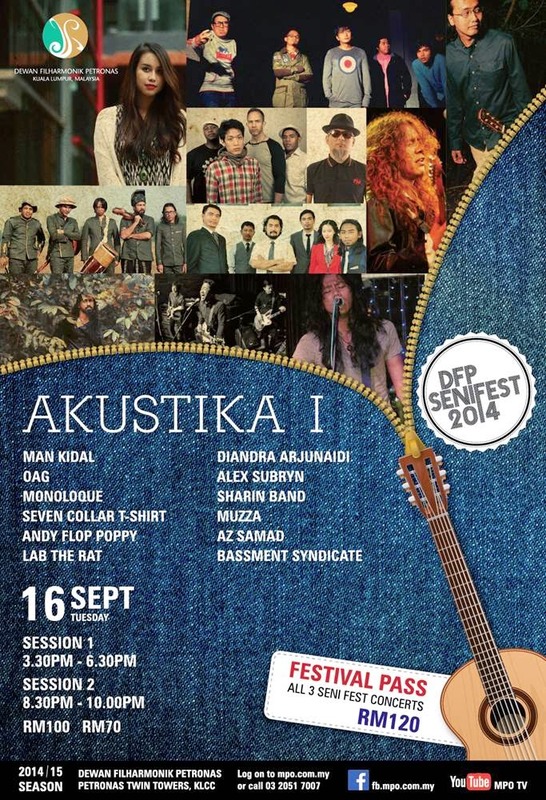 The DFP Seni Fest 2014 is an apt celebration of music and songs that coincides with the Malaysian Day (16th September 2014) and Visit Malaysia Year 2014 Festivities. There will be a Festival Pass priced at RM 120 for all three concerts. Do remember to mark down the details and join the week-long fabulous music appreciation, only at DFP!